A true Southern California hot rod, owned by William J. Bair from 1939 until his death in 2003. The car came to me October 31, 2009 not running. But I still couldn't be happier. I so much wanted to drive it, it hurt! I just needed to do so much before its wheels were rolling again. First off, the gas tank was out, as was the ruined leather seat. Somehow the car never had a fuel level meter --even the water temp gauge wasn't working. The heads were leaking water and, of course, the brakes were frozen. Finally, none the car's fluids had been changed in well over a decade. The list of things to do was growing even before I could restart the engine for the first time. Everything caked with grime. Probably not even once wiped down in decades. The seat was separated from the car. Liberal use of natural jute for a sound deadening. The gas tank was out, this is where it should sit. 15 Gallon tank is supported by wood & plumber's tape. Total loss, left outside for years. The only use it had was a a pattern for the new seats. Restoring the leather seat was perhaps one of the bigger challenges. I just wanted to make sure the new seat was correct. The 'antiqued' style red leather was discontinued decades ago, only vinyl was available. But I had to have leather! So I custom ordered it dyed to match a sample out of the car. I also needed a proper upholsterer to stitch the new hides to my exacting standards. Mark from Rudy's Custom Top in Hollywood was the only person to work on car other then myself, and I had to trust him. There were no margins for error. We used old pictures and the torn up seat to replicated it to what it looked like in 1959. Pictures of the seat done are further down the page. Flathead Ford V8s are my favorite engines. So working on Bill's V8 was a pleasure. Nothing very hard to do, it was all fairly strait forward repairs --mostly top-end stuff. Plus additional cleaning, torquing, adjusting. I took my time and did it right. The engine was actually in great condition inside with very little wear that could be seen. All the head bolt threads were chased, and gasket surfaces scuffed. I had the heads milled flat (not shown) at H&H. I also rebuilt the Stromberg 97 carbs myself. You may have guessed by now, I don't have an indoor garage. June, with the seat restored, it was time to enjoy the car. OK, here is the finished seat. Rather then reuse the noisy old springs, I used foam. I never planned changing any part of the look of the car. 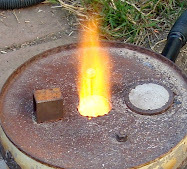 The biggest change was the addition of a chromed generator. I have to be honest, in all the photos that came with the car, the engine never looked as good as with me. Bill had an electric fan and alternator --I don't know if I could have lived with that. Second biggest change, was the addition of three under-dash gauges in a 50's Eelco gauge cluster. A temp gauge in each head and a much needed fuel level gauge --these are basic hot rod staples. I finally drove the car for the first time in May 2010. 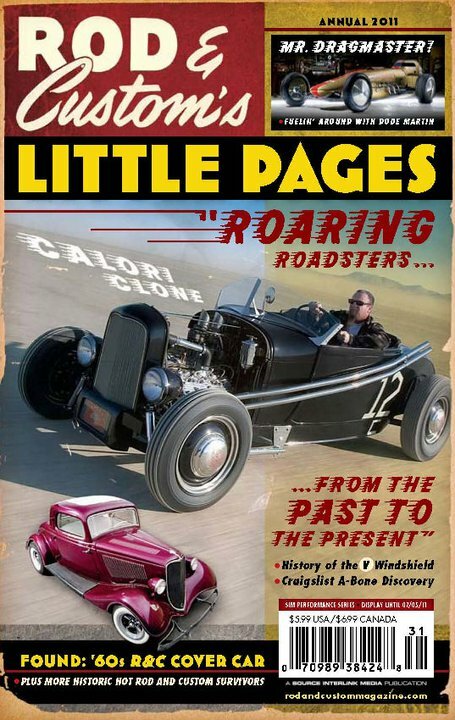 I learned so many new 'old' things about hot rodding working on 'Daytons', so named for the wheels. 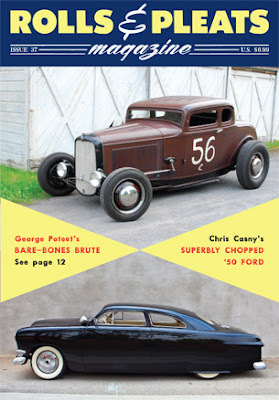 The car was a window into some of the things only done in hot rodding's heyday, 1945-1959. Here is the car --done. To see all blog posts related to this car going all the way back to the day I found it; CLICK HERE. Then at the bottom of that page, click "Older Posts" to go to the next page to see even more. 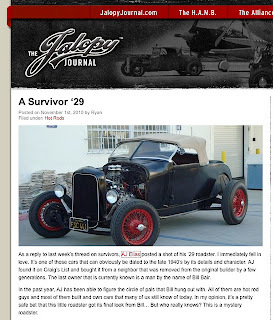 And, The Jalopy Journal, by Ryan. Post of the Day, November 1, 2010.